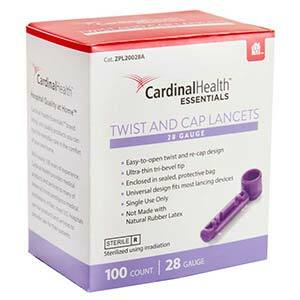 ReliaMed twist and cap lancets, 28G, purple, are uniquely designed with wings on each side of the lancet cap that contribute to the ease of twisting and recapping. Provides a larger surface area for gripping. Needles have tribevel, electropolished tips for maximum comfort. Compatible with most lancing devices. Single use; sterile. 100/box.